The Gay Gamer: What Scribblenauts' 'sambo situation' says about racism in the U.S.
What Scribblenauts' 'sambo situation' says about racism in the U.S. 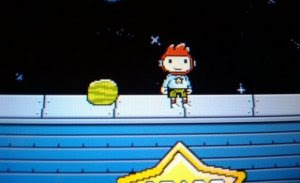 Unless you've been living under a rock for the past week, you've heard that one of the 20,000 or so words included in Scribblenauts' extensive dictionary is "sambo"--and that when a player uses said word in the critically acclaimed DS game a watermelon-like object appears on screen. Many writers have waxed poetic about this situation since it first came to light, but few (if any) have addressed it like author, critic and designer Ian Bogost did in an article posted on Gamasutra.com yesterday. You might not agree with everything the co-founder of Persuasive Games has to say (I can't say I do), but it's well worth a read regardless. Oh, and make sure you read the comments that follow the article, too--they're just as enlightening as Bogost's conclusions, if not more so.